This tale is the most famous one from the book The Malachite Casket, written by P.Bazhov, who based his stories on miners' tales from the Ural Mountains. The Urals, on the border between Europe and Asia, is the oldest mountain chain in the former Soviet Union and are famous as a source of precious stones and metals, including gold and copper ores such as malachite. The most famous character from these stories is the Mistress of Copper Mountain, a protector of gems and stones in the Urals, who capriciously bestows the ability to find such treasures only on those who please her. A long time ago in one Urals village there lived a famous craftsman named Prokopyich. 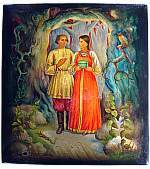 He made jewelry and other things from malachite and was renowned as the best gem carver in the Urals. The rulers ordered him to teach some boys his profession, but none of them was talented enough. At the same time an orphan named Danila lived in the village. He was weak and couldn't work at the factory. But he was full of dreams and liked to observe nature. Once he tried to help an old herdsman, but when he played his flute, the old shepherd felt asleep and several cattle were eaten by wolves. Danila and the herdsman were were severely punished. A kind old woman took Danila into her house and healed him using many herbs and flowers. She taught him the lore of plants, and one day told him about the Stone Flower from Malachite Mountain. She told him it was the most beautiful flower in the world. But she also warned him, "Whoever finds that flower will never be happy." After Danila recovered, the manager of the factory sent him to Prokopyich to study gem carving. He was surprisingly gifted. Prokopyich was a widow without children, and he loved the boy as if he were his own son. Several years passed. Danila became a strong, handsome young man. One day the owner of the factory sent him a commission to make a vase from malachite, along with a sketch of what he wanted. Danila began the intricate task, but he was unsatisfied with the idea on the sketch. Every day he went to the woods looking for inspiration and observing many flowers and plants. He worked for a long time and at last completed a vase like the one in the sketch. When he showed it to the other craftsmen, they liked it and praised it. But Danila said, "This vase is made precisely according to the sketch, but there is no living beauty in it. When you look at the simplest flower, joy fills your heart because of its beauty. Where is there such beauty in the stone?" One very old craftsman warned him, "Don't even think that way. Otherwise you could become a servant of the Mistress of Copper Mountain. Her workers live and work in the Mountain and nobody ever sees them. Once I was lucky enough to see their work. Magnificent! Our work can't compare with theirs, because they have seen the Stone Flower and understand the beauty of the stone." After this conversation Danila went to the woods more often looking for a block of stone for his own vase. Prokopyich was worried about him and urged him to marry the nice girl named Katya to whom Danila was engaged. But Danila said, "I want to wait! First I need to make my own vase and then we will think about marriage.". One day he was in the woods looking for stone and suddenly heard a whisper saying, "Danila-Craftsman, look for stone on Serpent Hill." He turned around and saw the dim outline of a woman, which vanished in a second. He thought, "Perhaps it was the Mistress of Copper Mountain!" So he went to Serpent Hill and found a huge block of malachite. He was very glad, took the stone home and started to carve the vase. But soon again he was disappointed with the result and said sadly, "Maybe I am just not able to understand the power and the beauty of the stone." So he and Katya announced the date of their wedding. The day before the wedding he went for a walk to Serpent Hill again, sat down and thought about the Stone Flower. "How I desire to see that Flower!" he mused. All a sudden the Mistress of Copper Mountain appeared before his eyes. Danila began to implore her: "There is no life for me without seeing that Flower!" She replied, "I could show it to you, but afterwards you will regret it. Those who have seen my Flower have left their family and come to live in my mountain. Think about Prokopyich and Katya who love you." "I know," shouted Danila, "but I must see it." "All right," she said. "Let's go then to my garden." So she took him and showed him the wonderful Stone Flower. In the evening Danila came to the village. His fiancee Katya had a party the day before the wedding. At first he had fun, danced, and sang songs, but then he became sadder and sadder. To Katya's questions he replied that he had a headache. After the party he returned home, broke his vase and ran away. The village was full of rumors after he disappeared, but no one knew where he had gone. Three years passed. Katya did not marry. After her parents died she came to live with old Prokopyich and helped him in his work. But soon Prokopyich died, too, and Katya lived on her own. She did not have any money, so she decided to try making some brooches. She went to Serpent Hill hoping to find good pieces of stone. But at the hill she remembered her beloved Danila and wept. Suddenly she saw a beautiful piece of malachite. Katya took it home and tried to carve several brooches. She worked hard and well and her carving beautifully set off the natural patterns in the stone. Katya was happy when she sold her works to a merchant in the village. She thought, "My brooches are the best in his store. I was lucky finding that malachite. Maybe Danila helped me?" She ran again to Serpent Hill looking for another good stone. But she thought again of Danila and burst into tears, sobbing, "Where are you, my beloved friend? Why did you leave me?" When Katya looked around it seemed to her she stood in an unfamiliar woods, and the mountain opened before her eyes. "Here is the magic mountain," she thought. "Maybe I could see my Danila." When Katya looked down, she saw a man who looked just like Danila. The man raised his hands toward her. She wanted to jump down to him, but the vision disappeared. She told her relatives what she had seen but they did not believe her and decided that she must be ill. The next day Katya ran to the hill hoping desperately to see Danila. Her sister followed her. Katya came to the same place and found herself in the magic woods. She started to call out, "Danila, where are you? Answer me!" The echo answered: "He is not here! He is not here!" Then suddenly the Mistress of Copper Mountain appeared and demanded, "Why did you come to my garden? If you need the stones, take what you wish and go away." Brave Katya replied, "I don't need your dead stones. Give me my Danila back. You don't have the right to take another's fiance." The Mistress laughed. "Do you have any idea whom you are speaking to?" Katya cried out, "I am not blind, I know who you are. I am not afraid of you! Not at all! And I know that Danila wants to come back to me." The Mistress said, "All right, let him speak then." At the same moment Katya saw Danila. The Mistress said, "You have to choose, Danila-Craftsman. If you go with her, you will forget everything you saw and learned in the mountain. If you want to stay here, you have to forget the rest of the world." Danila sighed, "I am sorry. I can't forget the people I love. I think about Katya every minute of my life." The Mistress smiled and said, "All right, Danila. Go back home. And for your honesty and loyalty I will give you a present. You will not lose your knowledge that you have learned here. But do not tell people about the mountain. If somebody asks you where have you been, just say that you went away to improve your skill." Katya and Danila returned home, filled with joy. Katya's sister could not find her in the woods and returned home. When she came into the house she saw Danila and Katya. She cried out, "Danila, where have you been?" Danila just smiled. "I went to study my craft with a master who lives far away. "Katya and Danila lived happily together for many years. He became known far and wide as the greatest carver in the Ural Mountains. Narrative and translation: Copyright 2001. Donna Richardson and Tatyana Stonebarger. Editor and introduction by Donna RichardsonSearch results:Page 1 of 2 total pages with 11 results. 2.25" x 1.25" x 1.00"
1.00" x 0.20" x 1.75"
7.00" x 6.50" x 3.50"
1.50" x 1.50" x 2.50"
2.25" x 2.25" x 0.75"
1.25" x 1.50" x 2.25"
7.00" x 5.70" x 2.00"
7.00" x 2.50" x 1.50"